The Janome Magnolia 7318 Sewing Machine is a classically designed sewing machine in all white. Measuring 18X10.5X14 inches and weighing just over seventeen pounds, this machine is small enough that a young beginner could easily handle it, but sturdy enough that it can be used for the advanced, bigger tasks. With 18 decorative and utility stitches, a 4-step buttonhole and an easy stitch selection dial, simple and intermediate sewing tasks have never been easier. 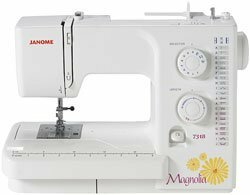 Take a look at the Janome Magnolia 7318 Sewing Machine video below for an overview of the key product features. There are a lot of great features that come with the Janome Magnolia 7318 Sewing Machine, and they’re all specifically designed for the user’s convenience. On the front, right side of the machine, you have two dials: one is the stitch selection dial that allows you to choose from eighteen different stitches and a four-step buttonhole while the second dial allows you to customize your stitch length (up to 4mm) and width (up to 5mm). Right next to the dials, on the edge of the machine, is a stitch chart so you can see all of your options and what the stitches look like before you choose them. There’s also a reverse lever that makes locking stitches easy. Other great features include a horizontal full rotary hook, retractable carrying handle, manual thread tension control, extra-high pressure foot lift, drop feed dog, push-pull bobbin winder, snap on pressure foot, a thread cutter located underneath the face plate and a horizontal spool pin. The Janome Magnolia also reaches a maximum speed of 830spm and is free arm/flat bed convertible. Those features aren’t the only great extras that come with the Janome Magnolia 7318. There are a bunch of accessories to get you started as well including three different feet, a pack of needles, three bobbins, a screwdriver, lint brush, seam ripper, two spool holders (small and large), an additional spool pin and a felt cushion. Basically, everything you need to get take care of your machine and start sewing. Janome is marketing the Magnolia 7318 sewing machine specifically towards beginners and those that take classes or need a lightweight machine that’s easy to carry. All of the features are user friendly, but the creators of the Magnolia made sure that this machine can be used on almost any project at any level. The customers that bought the Janome Magnolia agree. They love not only how affordable it is, but how anyone at any level can use this machine. It handles multiple layers flawlessly and is easy to thread, which is a common complaint for beginners. People also love how lightweight it is and don’t mind taking it to classes or quilting clubs. Most customers that purchased this machine highly recommend it to anyone at any skill level.